Managing data with accuracy, accountability, and speed is a must. This is especially true in law enforcement where successful outcomes often rest on an agency's ability to quickly process, track, and disseminate vital data, documents, and evidence with zero room for error. Discover how FileOnQ is leading they way with it's patened technology. Evidence Technology Magazine -- Automating helps agencies Manage Sexual Assualt Kits (May 29, 2015) – In today's DNA-Driven evidence environment, overlooking sexual assault kits (SAK's) that remain untested in an agency's property and evidence room could present a libility for the agency... and affect everyone from the property room personnel right up to the police chief or sheriff. See how it is possible for SAK's in an agency's possession to go untested? Discover how agecnies are overcoming some of the pitfalls of managing this kits and how FileOnQ's EvidenceOnQ solution is playing a huge role in improved testing and managing of SAK's. 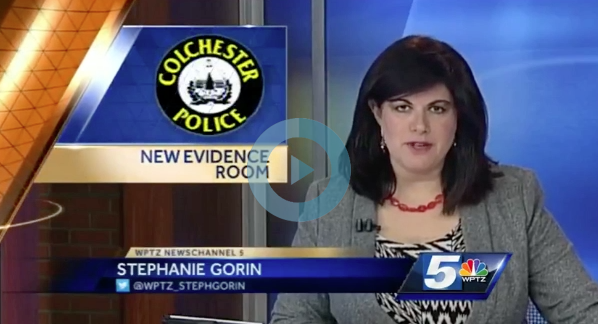 Cochester, VT – The Colchester, Vermont, Police Department has successfully implemented the EvidenceOnQ evidence management system from FileOnQ, Inc., helping to make their evidence chamber one of the best in the state.